14.240.040 Landscape Requirements for Parking Lot and Site Development. 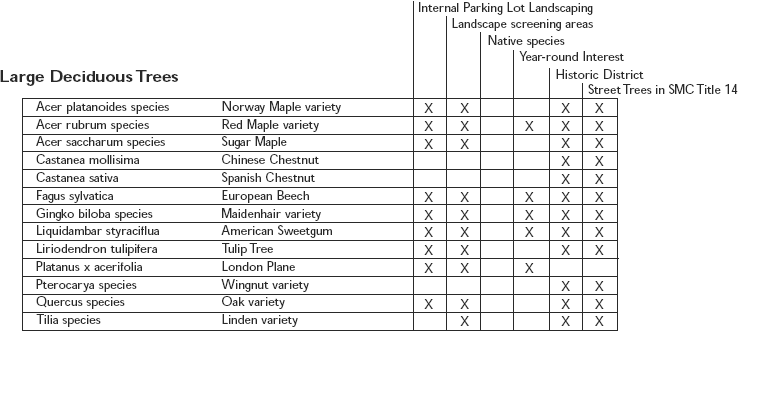 Requirements for landscaping of parking lots and site development are set forth in the two Snohomish design standards documents: the Design Standards and Guidelines for the City’s Historic District and Design Standards and Guidelines for Areas Outside of the Historic District. Landscape plant materials used in low impact development facilities may be considered for review by the City Planner when evaluating compliance with the landscape and screening requirements. A. Plant Materials. 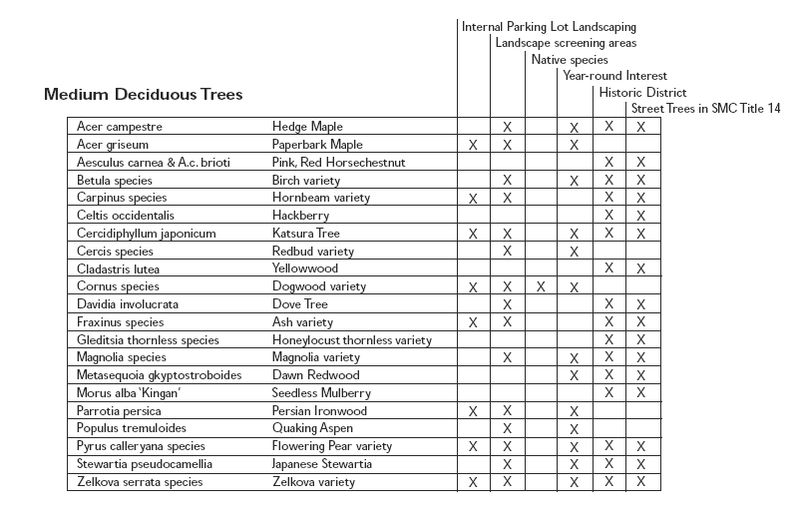 Landscape plant materials shall be selected from the landscape plant lists and street tree lists, as set forth below. 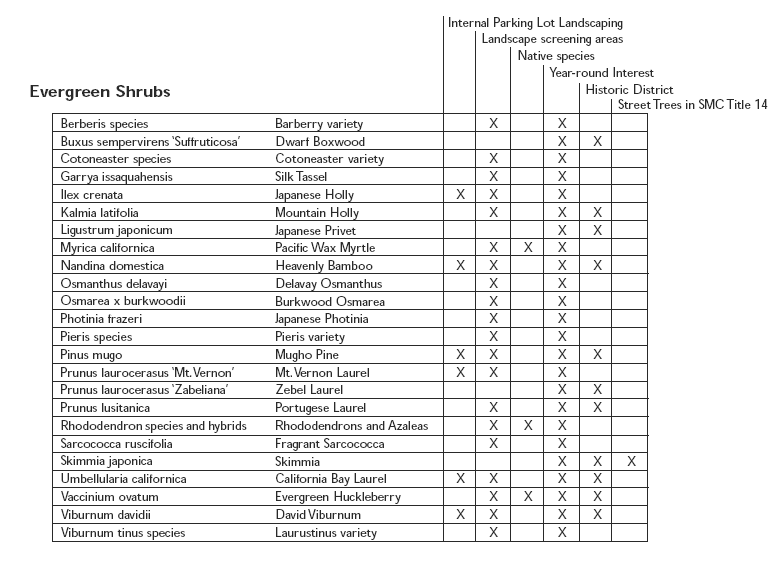 Plants used for low impact development facilities shall be selected from the bioretention plant lists contained in Appendix 3 of the LID Technical Guidance Manual for Puget Sound. Selected plants must be suited to local soil conditions, if the site is not irrigated. 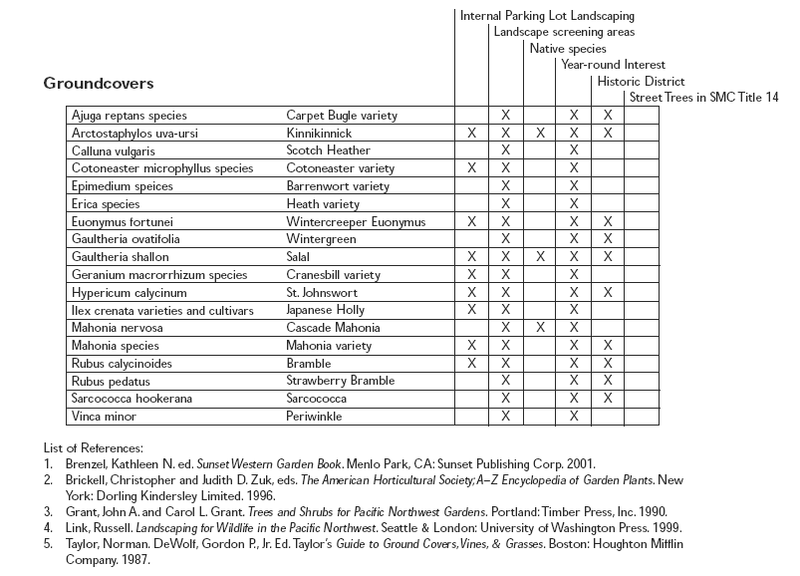 Native plant species shall be preferred. 1. Street Trees and Landscape Materials. a. All subdivisions shall supply street trees along the entire frontage of the property and any interior streets. Landscape materials, including for the purpose of low impact development facilities, may be considered for frontage plantings. vi. Rebuilding or installation of a street. c. All trees and other landscape materials, including for the purpose of low impact development facilities, planted to streets or in street right(s)-of-way must have approval from the City prior to planting and conform to the ROW vegetation maintenance regulations. 2. Trees. Deciduous trees or broad leaf evergreen trees shall have a minimum caliper two and one-half (2½) inches measured four (4) feet above ground level. Trees in street right-of-way shall be a minimum two (2) inch caliper, dbh. Coniferous trees shall be a minimum of six (6) feet in height. 3. 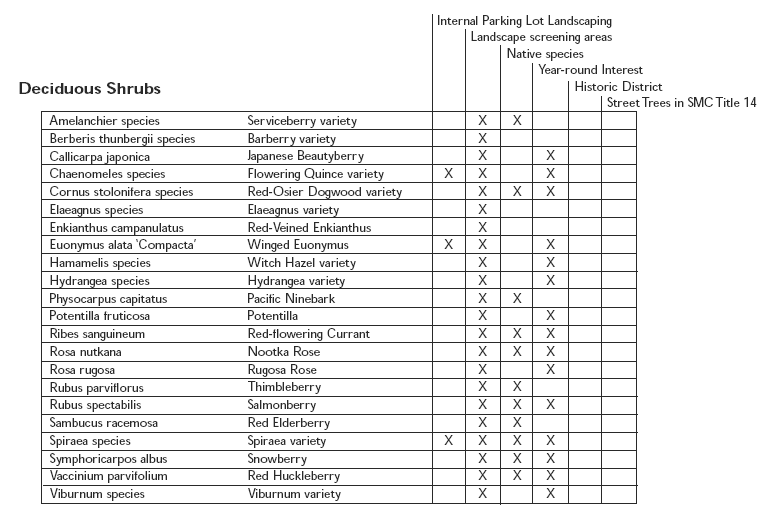 Shrubs and ground cover. An informal arrangement of plants shall be installed in order to provide a variety of height and texture that will enhance the architectural designs and attractively screen views of parked vehicles and visually incompatible site land uses, including, but not limited to, parking, dumpsters and service areas. Unless more specifically required, ground covers shall be installed so there is at least 75 percent coverage in two years. Installed shrubs shall be a minimum eighteen (18) inches in height, when mature height is three (3) feet for more. Shrubs with mature height of less than three (3) feet shall be a minimum of twelve (12) inches in height at planting. 4. 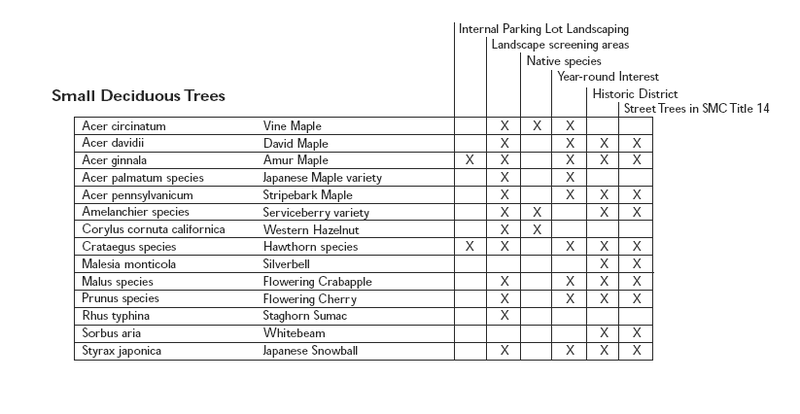 Applicant may select species other than those listed, only with approval of the City. B. Street frontage landscaping. Street frontage landscaping shall comply with the two sets of design standards adopted by the City of Snohomish: the Design Standards and Guidelines for the City’s Historic District and the Design Standards and Guidelines for Areas Outside of the Historic District. C. Perimeter landscaping on interior lot lines (buffering requirements). Note: In reaching a conclusion as to the exact landscaping buffer requirement to be used with regard to a specific development proposal, consideration shall be given to any existing buffer which may have been required on the adjacent property as a condition of the development on that property and how the additional buffer required of the new development may complement the earlier planting to produce a more effective result. Churches, auditoriums, and recreation facilities, including clubs, located in a Single-Family designation shall install and maintain a Type III planting strip, ten feet (10’) in width, on any interior property line. Where these uses are located in any use other than single-family, landscaping shall be provided in accordance with TABLE I above. Buffer requirements may be adjusted based upon Design Review Board or City Planner approval see Section 14.240.010(F). D. Interior lot landscaping. The two sets of design standards adopted by the City of Snohomish: Design Standards and Guidelines for the City’s Historic District and a separate set of Design Standards and Guidelines for Areas Outside of the Historic District will be used for primary guidance in this area. E. Outdoor storage and dumpsters. The two sets of design standards adopted by the City of Snohomish: the Design Standards and Guidelines for the City’s Historic District and the Design Standards and Guidelines for Areas Outside of the Historic District will apply. F. Landscape types. The intent of the landscape type and the minimum requirements for each are described below. 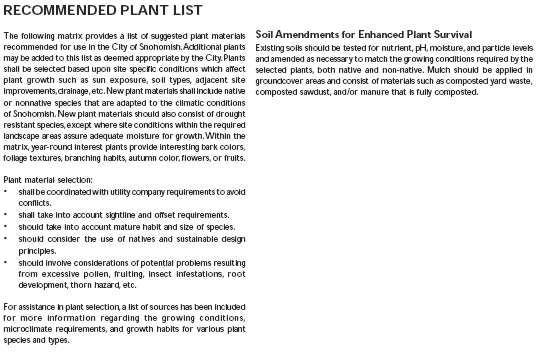 For minimum required plant sizes see Section 14.240.040(C), Landscape Development Standards. 1. TYPE I: Open Area Landscaping. a. Purpose. Type I landscaping is intended to visually soften large open spaces of parking areas. b. Description. Type I landscaping shall consist of deciduous trees spaced a maximum of thirty-five (35) feet on center in a continuous planting bed; a maximum of seventy-five (75) feet on center with segmented planting areas; and low lying shrubs with a maximum height of thirty-six (36) inches and ground cover or grass, which combined with shrubbery provide at least 75 percent coverage of the landscaped area within two years. Planting areas shall have a minimum width of four (4) feet. 2. TYPE II: Ornamental Landscaping. a. Purpose. Type II landscaping is intended to provide visual relief and add to the overall quality of a development by softening the effect of the new building upon the landscape. b. Description. Type II landscaping shall consist of conifer and deciduous trees planted an average of thirty (30) feet apart on center in beds at least five (5) feet in width, along with evergreen and deciduous shrubs and ground cover forming an effective screen so as to cover over 75 percent of the landscaped area within two years. 3. TYPE III: Visual Buffer. a. Purpose. Type III landscaping is intended to provide visual separation of incompatible uses from streets, arterials, and along property lines. b. Description. Type III landscaping shall consist of conifers or a mixture of coniferous and deciduous (no greater than 80 percent deciduous) trees. Maximum spacing shall be twenty (20) feet on center for evergreen trees and thirty-five (35) feet on center for deciduous trees. Shrubs and live ground covers shall provide for at least 75 percent coverage of landscaped area within a two year period. An earthen berm may be used with low shrubbery (maximum thirty-six (36) inches, mature height) in place of more level terrain with larger three (3) to five (5) foot shrubbery. 4. TYPE IV: Solid Screening. a. Purpose. Type IV landscaping is intended to provide a solid sight barrier to totally separate incompatible uses. b. Description. Type IV landscaping shall consist of a double row of evergreen trees (with rows offset) planted at a maximum spacing of fifteen (15) feet triangulated on center, earth berming at a minimum height of two and one-half (2½) feet, along with a ground cover to provide 85 percent surface coverage within two years. As an alternative to earth-berming, a six (6) foot high sight-screening fence may be incorporated into the landscaping, as approved by the Design Review Board.